Never in a million years would I have thought a movie with Jesse Eisenberg and Kristen Stewart could be funny. For the most part, I was very wrong. 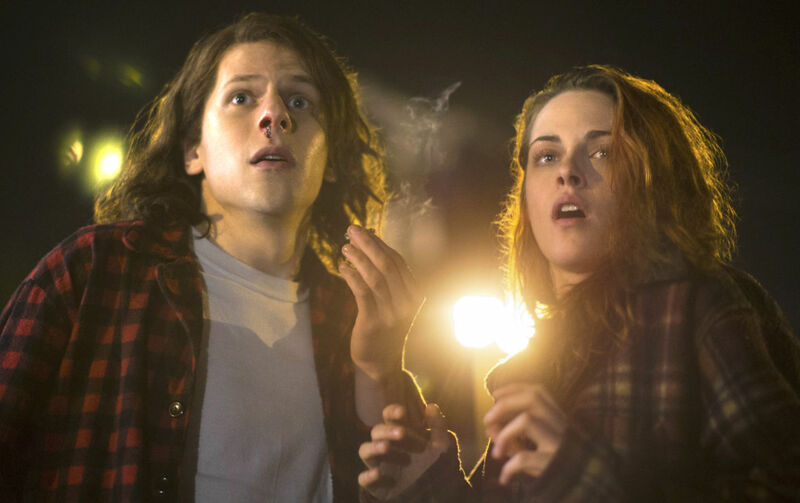 American Ultra follows the story of Mike and his girlfriend Phoebe, two stoners living in West Virginia. After a few strange occurrences, their lives take a turn for the strange when they realize that Mike unknowingly has a set of militaristic skills. It’s like The Bourne Identity of stoner movies. American Ultra is a stylized, yet ridiculous adventure that provides some good laughs, even if some of them are at the film’s expense. Everything in this movie is done haphazardly, which I couldn’t help but find a bit endearing. American Ultra succeeds in its primary goal of being funny. It’s got this sense of humor that sometimes is really trying to make you laugh, and sometimes you just think of how ridiculous it is, and you laugh anyway. A lot of this kind of comedy is sold by the way Mike and Phoebe get along. Jesse Eisenberg and Kristen Stewart aren’t exactly known for being comedians, but in this movie, they mesh together in a way that both makes sense and is hilarious to watch play out. Jesse Eisenberg as Mike and Kristen Stewart as Phoebe. This brand of comedy mixes great with the film’s frenetic action sequences. A lot of the choreography in these scenes made me think of Kingsman. The action is violent, but there’s always an element of comedy to make the violence a bit easier to handle. This brings out the ridiculous nature of the film, but at the same time, it gives it a sense of realism. The main character may have military skills, but he’s still a stoner, and the way he fights portrays that in a really cool way. Also, there were a few side things that I really dug about the movie. First of all, I just liked the way it played out in general. It’s this weird mishmash of a movie, blending in action with comedy and romance, and for the most part, it’s a fun ride. It gives the film a unique tone that is really odd yet very enjoyable. Also, I liked how even though the movie as a whole is one ridiculous adventure, there are still moments of narrative strength. Because the movie is such an amalgam of different genres, it never really got the chance to master anything other than comedy. I mentioned earlier that this movie was like Kingsman. However, the main difference between that movie and American Ultra is that Kingsman knew how to change the tone of a scene. It knew when it was time to get serious, and it knew how to get serious. American Ultra tries this in a few places, but the result is still something close to comedy. You end up laughing at the movie when you’re clearly not supposed to. Also, I didn’t like Topher Grace in the movie at all. His jokes weren’t that funny and he played the villain in the most annoying sense possible. It really made me dislike both him and his character, but not for the right reasons. He wasn’t developed, he wasn’t entertaining, and he didn’t really fit into this movie. And even though the film knew how to push the limits of a scene, it never quite understood when to stop. There was a whole subplot of American Ultra that pushed the run time way too long, and frankly, it felt very out of place in the story. It almost felt as if the filmmakers looked at the final product of the movie and thought, “This needs something else.” It really didn’t. The subplot pushed the movie ten to fifteen minutes past what felt normal, and frankly, it didn’t really add anything. American Ultra is a bit of a hot mess, but it’s a mess that you don’t want to look away from. It plays out like a comic book film, and there’s plenty of potential for future installments. If you’re sick of any seeing any particular genre of movie, then this is the movie for you, because it is something else. American Ultra opens August 21.